Arsenal boss not happy with Sanchez performance against Swansea. 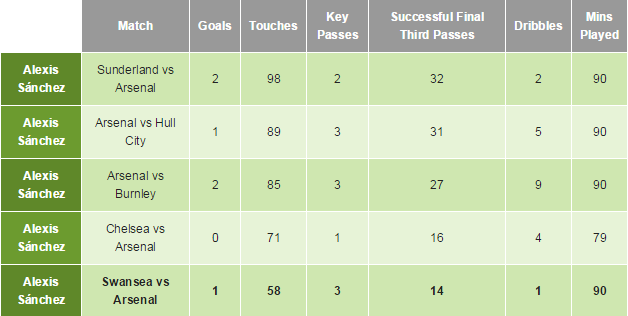 He touched the ball only 58 times, and completed only 14 passes in the final third.See Sanchez stats 14-15. Arsenal visited the Liberty Stadium yesterday to play a Premier League game against Swansea City but returned home frustrated as they failed to pick a point. Alexis Sanchez who was the only goal scorer for Arsenal yesterday was criticized by his own boss Arsene Wenger despite of scoring a goal. The former Barcelona man gave Arsenal the vital lead by scoring his 8th goal of the season in Premier League but the Gunners failed to keep that lead as the Swans scored twice to grab a vital victory. Sanchez who signed in the summer for Arsenal is currently the top scorer for them. Despite of a goal yesterday Wenger said that he was not up to his mark as compared to his past performances. The below stats table reveals that Wenger is right, the Chilean had better games in the last weeks. He touched the ball only 58 times, and completed only 14 passes in the final third. Sanchez is currently Arsenal's best player and is proving his worth. He has done so much for Arsenal in his debut season so far and hopefully will continue to shine. Do you think Sanchez failed to impress yesterday?